This brick-Temple originally a Jain Temple, now dedicated to Siddhesvara Mahadeva is one of the oldest of its types with sikhara of Nagara style. Probable date is c. 11th/12th cent. AD. 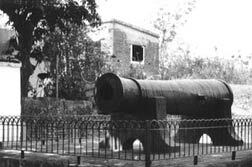 It is a big cannon made of wrought iron and believed to have been fired by the God Madan Mohan himself when the Marathas attacked Bishnupur. The cannon is mounted on a masonry platform. It is 3.8m long with a bore 28.6cm. c. 18th century AD. The gun is inscribed with Persian words. 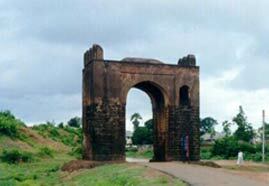 This gate of laterite stone was the inner entrance to the old fort of Bishnupur, said to have been built by the Malla King Bir Singha. Second half of the 17th century AD. Three laterite temples representing the prevalent local thatched hut-type and sikhara of North India are combined. It is known from the foundation stone tablet on the northern-most temple that the temples were built in 1726 AD by the Malla King Gopal Singha. 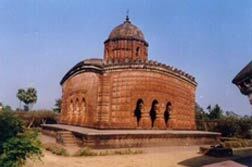 This temple of carved bricks represents two Bengal hut shaped structures joined together with a small tower on top. The temple os exquisitely carved with terracotta ornamentation depicting epic story, Puranic episodes and Krishnalila etc. Besides it consists of the vegetal and animal world and contemporary life. 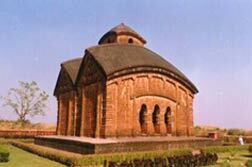 It is one of the best carved temples of Bishnupur. The design of the lower storey of this laterite temple is based on the thatched hut of Bengal and the tower is of North Indian type of Sikhara. 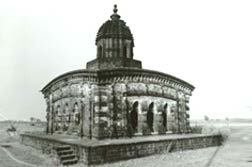 This Ekaratna temple is enclosed by a double compound wall in bricks now in ruins. This temple was built by Raghunath Singh in c. 1656 AD. This laterite temple of Ekaratna type with traces of decoration of plaster has a single tower resting on a square building with the curved roof, characteristic of Bengal Temple architecture, a combination of the North Indian and Bengal architecture. Inscription records its erection by Bir Singha in 1658 AD. This laterite temple having five numbers of sikhara on a curved Bengal-type roof was built in c.1665 AD. 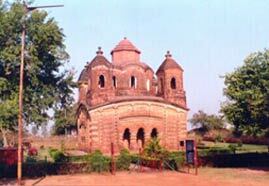 It is the only Pancharatna temple in laterite in Bishnupur. 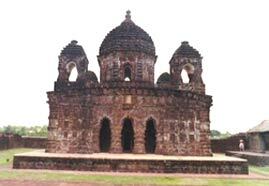 It is an Ekaratna Temple built on a laterite plinth and profusely decorated with ornamental bricks. This temple consists of a single tower on a square curved Bengal-type roof. 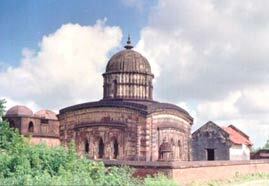 It is enclosed by a high compound wall of bricks and a ruined Kirtansala on the south. 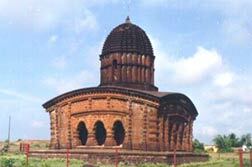 The exquisite carvings on terracotta depicts epic and Puranic episodes and Krishnalila as main theme and the temple is one of the most elegant temples of Bishnupur. 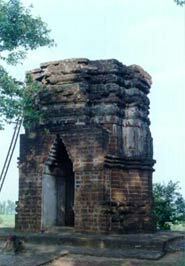 Inscription records its erection by the Malla King Durjan Singha in 1694 AD. 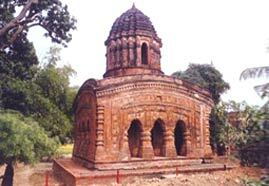 It is built of laterite and plastered, it consists of a tower on a square building with mouldings near the base and the oldest dated temple in Bishnupur. Inscription records its erection in 1622 AD by Malla King Bir Singha. 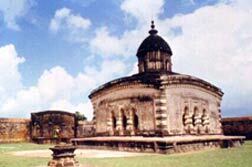 It is the only Siva temple built by the Malla Kings. 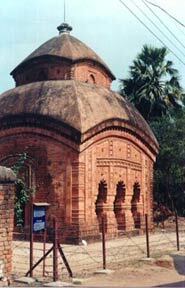 This laterite temple of Ekaratna type consists of a sikhara on top of a square lower storey with curved roof characteristic of Bengal Temple architecture. Inscription records its erection by Siromani Devi (also called Chudamani), wife of King Bir Singha in AD 1665. It is built of laterite stone and has a tower resting on a square building with the curved roof characteristic of Bengal-type. It is datable to c. 17th century AD. 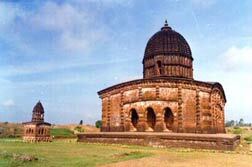 It is an Ekaratna temple, built of laterite. This temple has a lower storey of the thatched hut of Bengal-type and a tower above like the north Indian sikhara. It is datable to the second half of 18th century AD on stylistic consideration. Two images of standing Vishnu on both sides of the entrance to the sanctum are noteworthy. This is a brick-built Atchala temple consisting of a sanctum with a corridor on all sides. 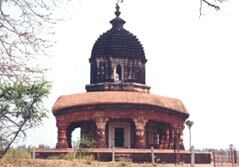 The roof is curved and is surmounted by a small hut like structure, therefore it is an atchala temple. The carved brickwork of this temple is of high order. Inscription records its erection in 1659 AD by Raghunath Singha. It is an Ekaratna temple, built of laterite and consists of a square lower storey in thatched-hut fashion of Bengal Temple architecture with a curvilinear tower above it. The facade of the temple is profusely carved. Inscription records its erection in 1729 AD by Krishna Singha. There is a beautiful stone chariot in the temple compound. 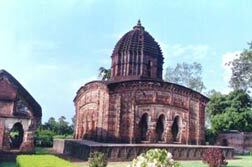 This Ekaratna Temple is built of laterite and consists of a square lower storey with curved roof characteristic of Bengal Temple architecture and a north Indian sikhara on top. Plinth of a bhoga mandapa built of laterite stands in ruins to the west. Built in C.1737 AD. The temple has exquisite ornamentation particularly in its front wall depicting Puranic episodes, Dasavatara, animal and lotus symbols. This Ekaratna temple, built of laterite and faced with carved stones, consists of a square curved roof structure with a single tower and a fluted dome on top. Inscription records its erection in 1758 AD by Chaitanya Singha. Elaborate stucco ornamentation has enriched the temple. Built on a laterite plinth, it is an impressive square building with a small shrine in the centre and three-corridor galleries with vaulted roofs enclosing it. The building is used for putting up idols from other temples on the occasion of Ras festival. It is datable to c.1600 AD. 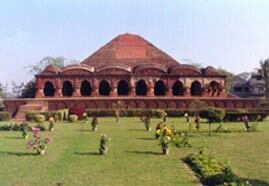 This brick-built Temple is situated within the fort and consists of a square roof surmounted by five towers and is thus an example of Panchratna type. The central tower itself is octagonal enclosed by a octagonal corridor. 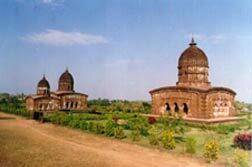 The temple is the most profusely carved temple in Bishnupur. 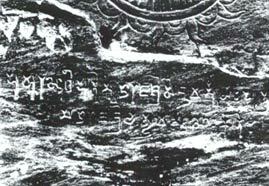 Inscription records erection by Raghunatha Singha in 1643 AD. 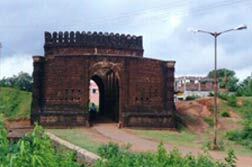 This small gateway of laterite commanded the inner entrance to the old fort of Bishnupur. It was erected in c.17th century AD. This model chariot is built of laterite and consists of two lower storeys with arched opening and a curvilinear tower on top and has three stone wheels on each side. It may be dated to c. 17th century AD. The temple is made of laterite stone, which possibly had a sikhara of the Nagara style presently missing. The probable date of construction is disputed. R.D.Banerjee suggested first half of the 11th century AD while D.B.Spooner records AD 1346 attributing it to Prithvi Malla without much ground. 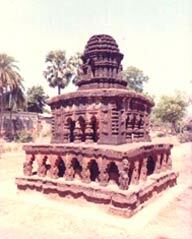 This is a laterite temple, which possibly had a sikhara of the Nagara style presently missing. The probable date of the Temple is c.11th century AD according to R.D.Banerjee while Spooner suggested AD 1346 attributing it to Prithvi Malla without any valid ground. 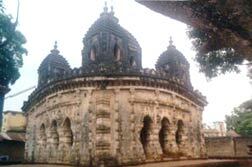 It is a stone-built Temple Pancharatha in plan having affinity with the Orissan Temple architecture. It was erected probably in c.17th century AD. The Temple is situated within an enclosed compound. 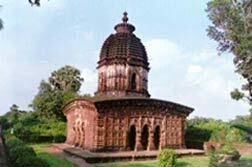 This is the largest laterite Pancharatna Temple of Bankura District, built during the reign of Raghunath Singha in c.1643 AD. The walls on the east and south have depiction of sculptures in laterite which include Dasavatara panels. Inscribed foundation stone is fixed on the facade. 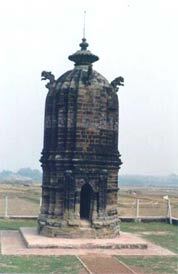 This is a stone temple of Siva with Sikhara surmounted by an amalaka. The Temple was probably built in the second half of c.18th century AD. 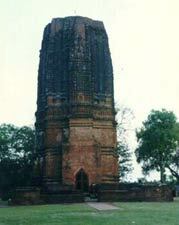 It is a brick-built Temple with a sikhara of north Indian type on top. It was built in c.17th-18th century AD. There are two inscriptions one engraved on the face of a rock and the other to the right of a wheel. The first records that the cave was the work of the Maharaja Chandravarman, the Lord of Pushkarana. The second says that the village Choshagrama was given as gift to one Chakrasvamin. The inscription have been dated to the 4th century AD. Susunia is a hill 443 m high extending 3.2 km east-west. The mound is submerged in water. It is reported that the area is of great antiquarian interest and has yielded a number of Jain and Hindu images including that an image of Surya. 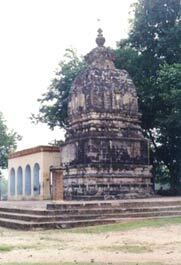 The mound of an old Jain temple is presently submerged and represented by a statue of Parsvanath. The site represents the image of Durga slaying Mahishasura under a tree. The mound area containing the remains of a temple is presently submerged. Originally the mound representing the ruins of a temple with an image of Nandi on it is now submerged and the Nandi is kept in a nearby area. The mound containing the ruins of the temple is presently submerged and the statue of Ganesh and Nandi have been shifted to a nearby area.